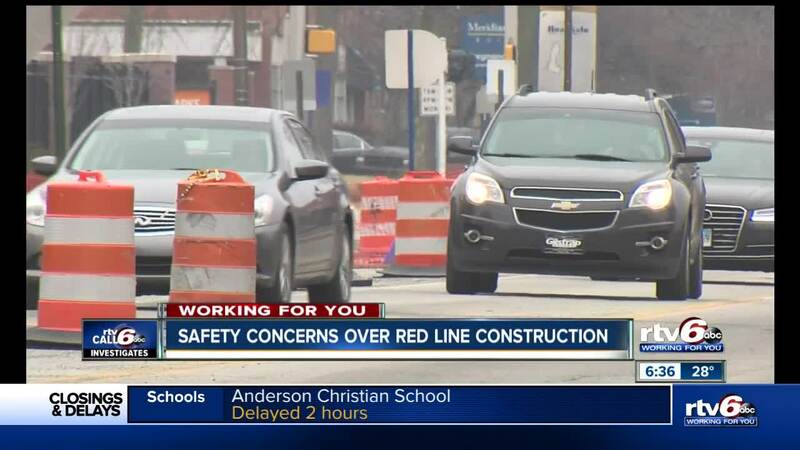 Between the morning rush, potholes and now Red Line construction, downtown drivers are facing an increasingly frustrating and sometimes dangerous commute. INDIANAPOLIS — Between the morning rush, potholes and the accelerated Red Line construction, downtown drivers are facing an increasingly frustrating and sometimes dangerous commute. You’re supposed to follow the signs on the side of the road, but at Capitol and 11th streets, that’s not the case. The signs say, “begin right turn lane here” and “right lane must turn right” but if you get into that lane – you’ll hit a new sidewalk ramp that was installed as part of the red line construction. The new ramps were approved, and the right lane will eventually become a parking lane, according to permits obtained by Call 6 Investigates. IndyGo says they have directed the contractors to remove those signs, now that construction is underway. IndyGo says drivers need to be aware of temporary and permanent construction changes if you’re commute takes you through a construction zone.